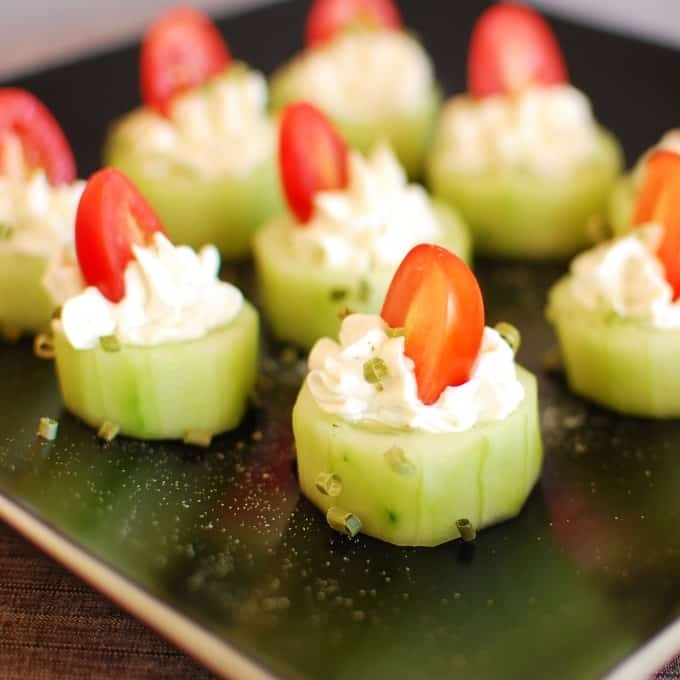 Stuffed cucumber bites is an easy and satisfying appetizer everyone loves. With New Years Eve coming soon, I think an easy, tasty hors d’oeuvre that can be made quickly and will feed your many guests is in order. This is tasty and so easy, you will love it. You just need to squeeze the cream cheese from a piping bag (like this one linked here), into the hollowed out cucumbers! It will look like you spent a lot of time preparing this, but it is really simple. 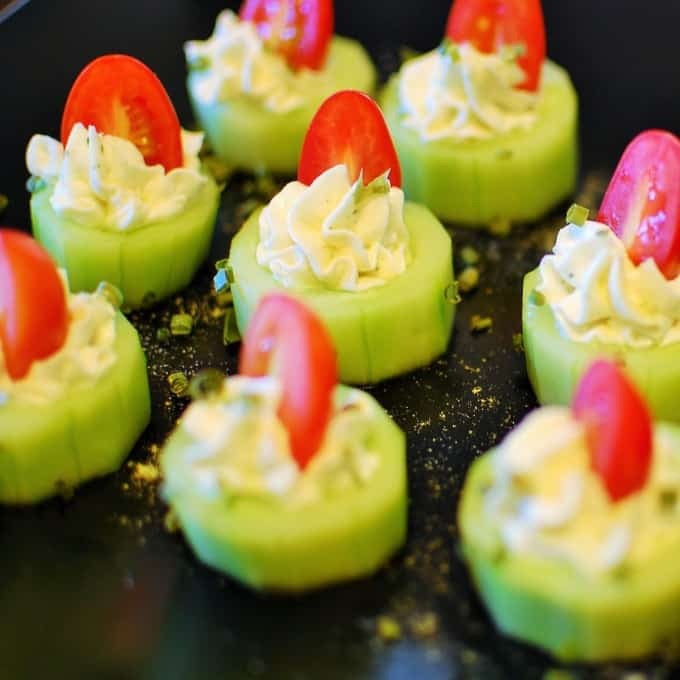 The finished product is Stuffed Cucumber Bites! MaryJo gives this a two thumbs up! And she’s the primo taste expert. So, we were asked to bring a small appetizer to a party. And the party was on a houseboat that our friend has at our old marina and she lives on the boat full time. (So did we until we sold our boat and moved on land)! Laurie always has a big crowd of people on her boat and the party goes way past my bedtime! Anyway, I made a double batch of stuffed cucumber bites and people loved them. They are not gut filling so you can eat several, but still have room for the meatballs in gravy and the little wieners drenched in sweet BBQ sauce that other people brought. Know what I mean? I love potluck appetizers and this one is a winner. And I did eat a couple little wieners. 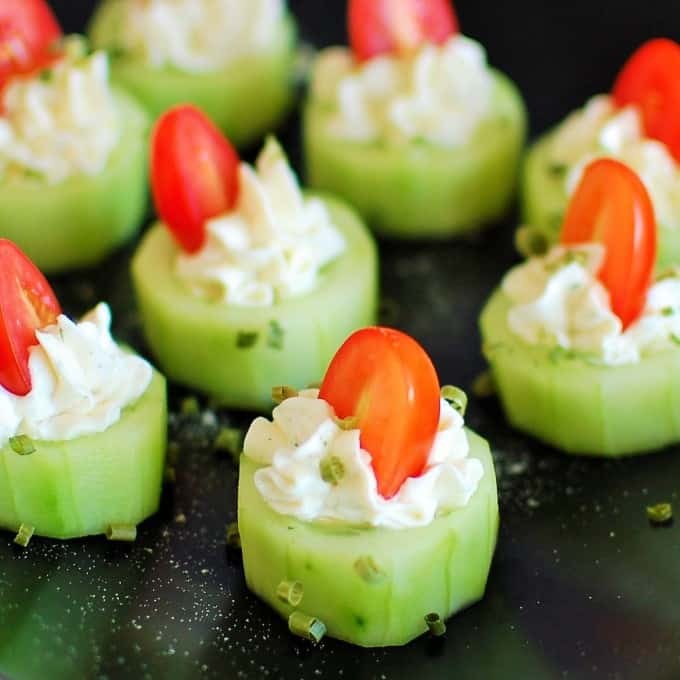 Stuffed cucumber bites are something I will be bringing to the big games. Really easy and delicious. If you don’t particularly like cucumbers, use 1 inch pieces of tender celery, You know, the inside pieces that are not as chewy as the outside stalks. (Save those for cooking with)! Just square off the bottom on the celery a little so it will stand up. Either way, these easy appetizers are winners. Surprise your friends and family by bringing a great tasting and delicious looking party treat! Just make sure that you make enough for everyone. 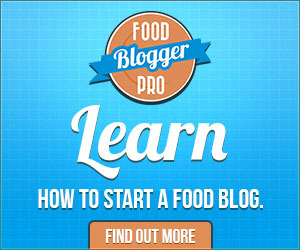 This is an easy appetizer which tastes great! Peel and slice cucumbers to 3/4 thick. Mix the cream cheese, mayo, hidden valley ranch mix and salt in a bowl. Stand a halved grape tomato in the cream cheese. Hi Virginia. It would be best to make them the same day. I’m afraid that the cucumber and cheese would dry out and not be as appetizing looking. Everyone loved them, and thought it took a long time, but it was literally 15 mins. I used what was left of the ranch packet and sprinkled over the tops when they were assembled for extra flavor. Hi Carine….Glad everyone liked them. Good idea with the remainder of the ranch packet! My mind is whirling thinking of all the ways to modify this yummy recipe with different toppings, green or black olives, piece of shrimp, black beans, chunk of chicken, pepperoni,,,,,and on and on. Love it! Hi Terry…that is genius! What flavor the crabmeat would add, I’m doing this! Thanks. I tried a melon baller, a small one, and it was still too big, so I used one of my son’s plastic baby spoons and it worked like a charm! I also added just a touch of finely shredded sharp cheddar to the top, then the tomato and chives, and it gave it just a little extra pop of color. Thanks for the comment Billie. The cheddar would give a nice flavor boost! Just got done making these for a New Years Eve Party this evening. However, I substituted the mayo & ranch dressing for chive & onion cream cheese, and they are DELISH!!! How many did the recipe make? Hi Terri, You should have enough filling to make 18 to 20 bites. Very creative! Great way to have cucumbers. IM TRYING THIS AT MY NEXT PARTY . Sounds good and good for you! 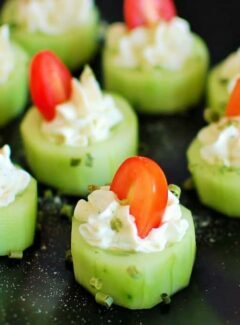 What delicious and healthy appetizers.. these are just so perfect after the indulgent Christmas I just had!